ICC's Compact CAT 5e data module is a cost-effective solution designed to provide broadband internet access for up to eight (8) computers in a residence. 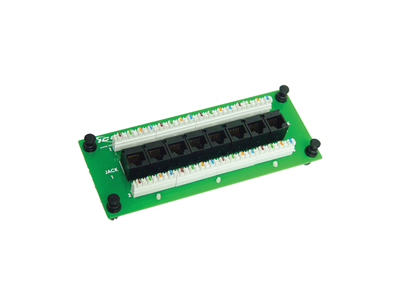 The module is integrated with a non-bridged CAT 5e data board with eight (8) standard 4-pair 110 IDC connectors providing high performance connectivity that's tested to exceed TIA/EIA-568-B.2 industry standards. ICC's Compact CAT 5e data module is UL listed and has a PCB board design, without housing, offering the same performance. It works with ICC's 14", 21", 28" and 42" Residential Net.Media Centers and features a push-pin design for simple and easy installation. Use ICC's CAT 5e UTP solid cable. *Note: Requires the use of a network switch or hub.